And the Award goes to … Ilmsens! Berlin, 2016: A wonderful day has come to an end – and what a wonderful start it is to begin a promising future! Ilmsens GmbH has been competing in the Science4Life competition - and turns out we just brought the award back home! 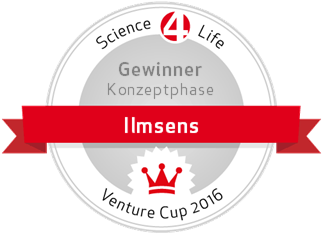 Elected for best concept phase of a business plan the jury has awarded Ilmsens with the “Venture Cup 2016” Award! We are very grateful for this prize that is furthermore endowed with 2.500 € and would like to thank the Science4Life-Team for their great help and the lovely days in Berlin! If you don’t know what Science4Life is: Founded 1998 Science4Life is a German business plan competition with the aim to support startups and teams in the early state and seed phase. Target sector for this award is the wide field of Life Science including Chemistry and Energy.